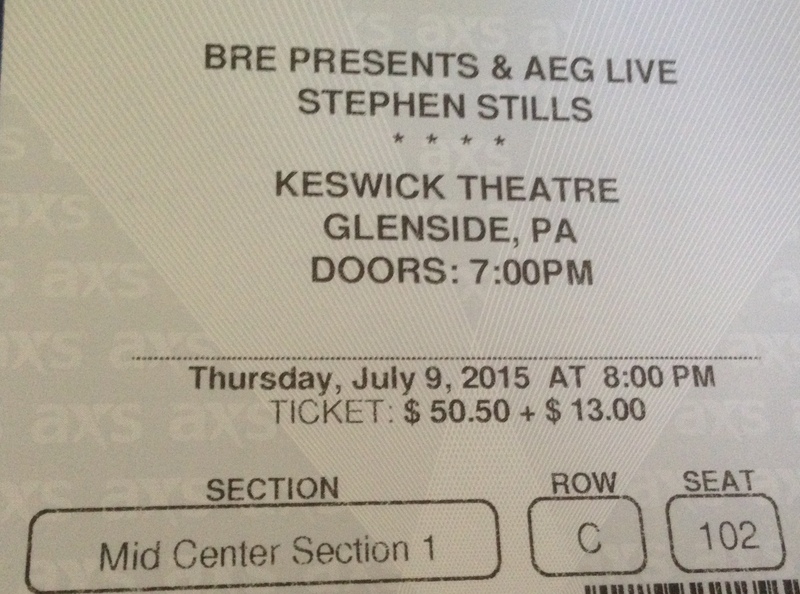 Stephen Stills has long been one of my favorite artists, yet I’ve rarely seen him live – one of those oddities of life, I suppose. For those who may be unaware of who he is, and I imagine that means a number of younger folks – he’s the S in CSN (and sometimes Y); and was the driving force behind Buffalo Springfield, whose “For What It’s Worth” is one of the de rigueur protest songs used in films and TV shows about the 1960s. His solo hit “Love the One You’re With,” released in 1970, is another go-to song often used to evoke the free-love aspect of that era. And, in the early 1970s, he released a string of excellent, four- and five-star solo albums – especially the sprawling double-LP Manassas set. His were the first songs I played when I deejayed the Folk Show at Penn State in the mid-1980s: “Crossroads/You Can’t Catch Me” and “Everybody’s Talkin’ at Me” from his 1975 live album. Anyway, as I wrote a few months back, I first saw him in 1984 at a Walter Mondale rally in Philly; as I remember it, he was good – but it was a four-song set. I also saw him that same year with Crosby, Stills & Nash at the Mann Music Center – an excellent show, if my memory is correct; and in 2002 with Crosby, Stills, Nash and Young at the Wells Fargo barn, though at the time it was known as the First Union Center. That was an incredible show. Anyway, all things considered, his July 9th, 2015, concert at the Keswick Theatre in Glenside, PA, was very good – “all things considered” being the optimal phrase. Through the years, Stills has developed hearing issues that have caused singing to become something of an issue for him, especially on acoustic/softer numbers. He’s not always in tune. On songs when he sings from his gut, he sounds great. Deafness hasn’t impacted his guitar playing, however; he basically put on a two-hour clinic for how to wrench emotion from six strings. “Suite: Judy Blue Eyes” was a wonder to behold. The show was split into two hour-long sets. The first consisted of acoustic (and a few gentle electric) numbers; the second was electric, rockin’ and bluesy. He was also in a talkative mood, recalling conversations with Fred Neil about “Everybody’s Talkin’ at Me,” Bob Dylan about “Hollis Brown” and Steve Jobs about the iPhone’s subpar sound. – and featured quite a few cover songs, including his take on Graham Nash’s “I Used to Be a King.” He borrowed the arrangement from Shawn Colvin, he said, and it was powerful. Unfortunately, my recording of it stopped mid-song when I received a flash-flood alert – it was stormy night. Thunder rumbled during “Everybody’s Talkin’ at Me,” in fact. I’d have loved it if he’d included a few more of his own classic compositions – “Fishes and Scorpions,” say, or “Black Queen,” “See the Changes” or “First Things First.” Still, no complaints. – and continued with two songs from the Rides, the stellar blues group he formed with Kenny Wayne Shepherd and Barry Goldberg a few years back. “Bluebird” flew high; and a fierce “Rockin’ in the Free World” came close to blowing the roof off the venue.